Our cleaning and deodorizing services will leave your carpets and area rugs looking like new and smelling fresh. Rightway Stone and Carpet Care specializes in all types of carpet and upholstery cleaning for commercial and residential clients. Pre-Inspection – Our cleaning specialists will walk through your home with you to visually inspect the carpet. He will identify potential permanent stains and give you an evaluation of expected results. This is a free on-site inspection, that provides an explanation of services and an exact price. Vacuum – Dry soil is removed by a thorough vacuuming. Removing dry soil is one of the most important steps in cleaning. Furniture Moving – Our regular pricing includes moving light furniture such as sofas, chairs, tables and smaller items. Beds, dressers, and heavier pieces are left in place under our regular pricing structure. Our cleaning specialist can quote the exact cost any heavier pieces. Pre-Treatment – Application of a detergent pre-spray that will suspend the soils from the carpet fibers. We pre-treat the carpet to loosen dirt and oils that vacuum cleaners cannot remove. The pre-treatment is effective on different types of stains and dirt. It will also enhance the color and brighten lighter carpets. Pre-Spot and Agitation – Difficult spots are pre-treated with special solutions to increase chances of removal. The pre-sprayed areas are agitated so that the detergent actually contacts the soils and can release the attachment to the fibers. Clean and Extract – We will steam clean your entire carpet with our van-powered deep-steam cleaning process. Your carpets will be cleaned down to the base and will also remove deep down bacteria, pollens, and chemicals. Rinse and Neutralize – Leftover carpet cleaning solutions can act as a magnet for dirt. That’s why we apply a pH-balancing fiber rinse that removes carpet cleaning solution residue right along with deep-down dirt. So all that’s left behind is cleaner, softer, more beautiful carpet. Final Finishing – Your carpet is groomed with a professional groomer so that the pile of your carpet is standing tall when we leave. Grooming enhances the carpets appearance by providing a uniform look and it helps the carpet pile dry faster and in the right position. Post-Cleaning Inspection – Our cleaning specialist will walk through your home with you to point out the cleaning results to make sure that you are completely thrilled with the job. Drying Time – Most carpets will be dry to the touch in about 2 hours. 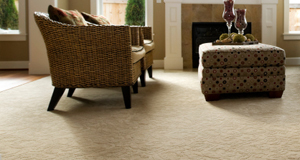 Drying times depend on the degree of soiling and type of carpet. Each rug is examined to determine the cleaning method best suited to your rug’s particular weave, fibers, and dyes. Hook rugs, Throw rugs, Orientals, Carved rugs, you name it and we clean it, safely and effectively. Almost all new carpet has some type of protective overspray called a “fluorochemical” applied when it is manufactured. Whether it is 3M’s ScotchgardTM, Dupont’s Teflon® or the carpet manufacturer’s own product, there is usually some type of protection applied at the mill. You might remember when your carpet was new that any type of spill beaded up on the top of the carpet. You might also notice now that in the traffic areas of your carpet, spills no longer bead up and they tend to just soak through. The protectant helped keep spillage from actually getting to the acid dye blockers and resist dry soil. That protective overspray the mill applied wears off with foot traffic (just like the wax on a new car wears off). This is why most manufacturers recommend a protective overspray be applied after cleaning to replace whatever has been taken off with wear. In addition to protective oversprays resisting spills, they also help prevent the carpet from wearing. The majority of soil found in your carpet is known as particulate soil which would have been tracked in from outside. Making sure that you have a sufficient amount of protector on your carpet will help keep the soil from bonding to the carpet. By resisting dry soil, less soil bonds to the carpet, therefore being picked up by your vacuum or cleaning. If soil bonds to the carpet, it acts like sandpaper on your traffic area. Once the area yarns are broken down, there is no way to bring them back to their original state. As the finishing touch to your professionally cleaned carpet, DuPont Teflon®Advanced or 3M Scotchgard® Carpet and Upholstery Protectors can be professionally applied. Either protector helps carpet and upholstery resist soiling from dry dirt, water- and oil-based spills. Carpet stays cleaner – longer. Carpet protector also helps solve static electricity problems. Don’t be without out this valuable protection against dry soil and spills. The most trusted name in carpet and upholstery protection. Keep your carpet and upholstery cleaner, spot free with this fine product. Just ask us how this time tested product works and we will be glad to explain it to you.